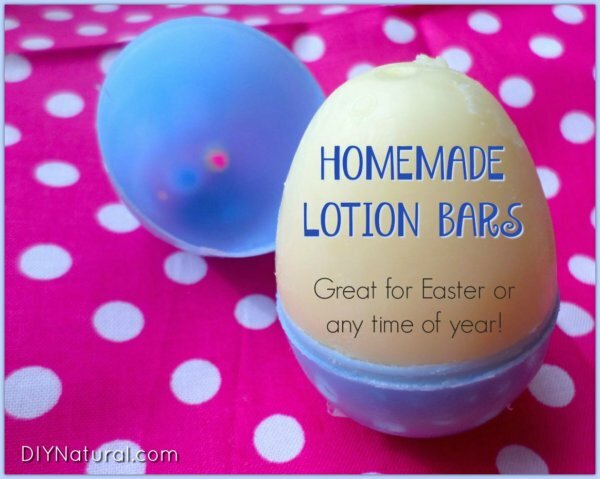 These Easter lotion bars are awesome any time of year! They’re simple to make, keep well, and they work great. 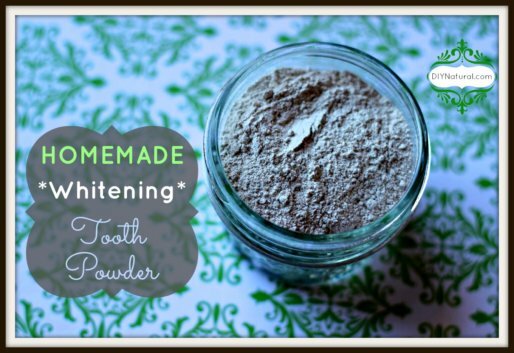 Make them for personal use or gift giving. I was almost taken by surprise when I went to the grocery store yesterday and saw the mountains of candy, Easter baskets, and spring decor. It seemed to have shown up overnight. Needless to say, I started my Easter shopping right then and there. Of course, I picked up a few chocolate bunnies and some naturally flavored jelly beans, but we really try to limit the amount of sugar our family consumes. So I started looking for alternative gifts to give other than sweets. I really struggled with finding items other than stuffed animals and movies, so I decided that I would try to DIY a few cost-effective Easter gifts. 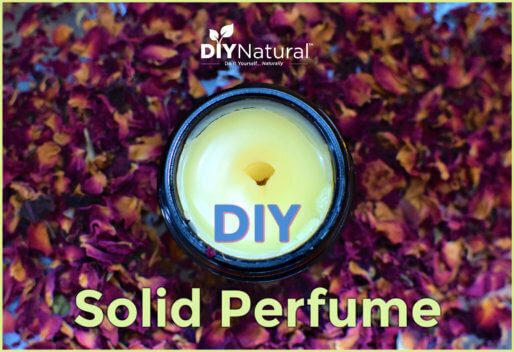 One of the easiest things to create is a lotion bar. 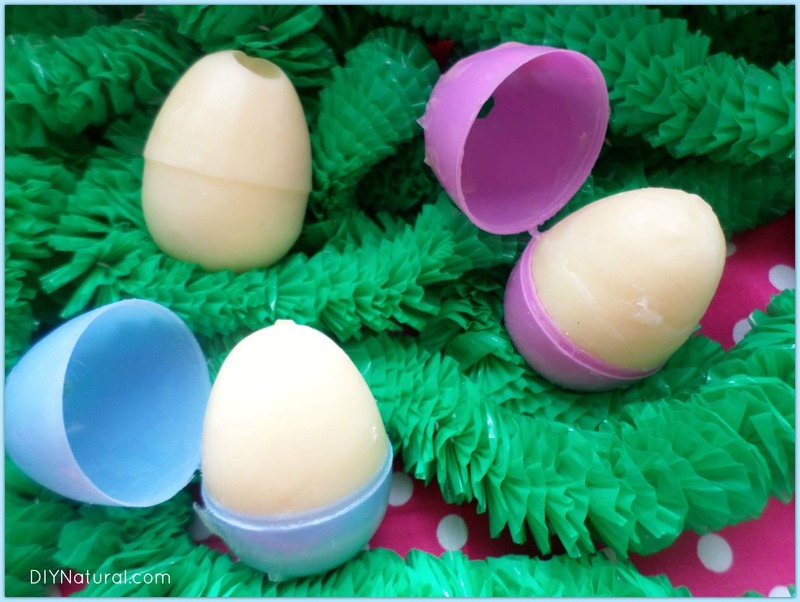 These are great any time of year, but I thought lotion bars would make adorable additions to our Easter baskets this year, especially because the molds will also serve as easy storage of these bars. 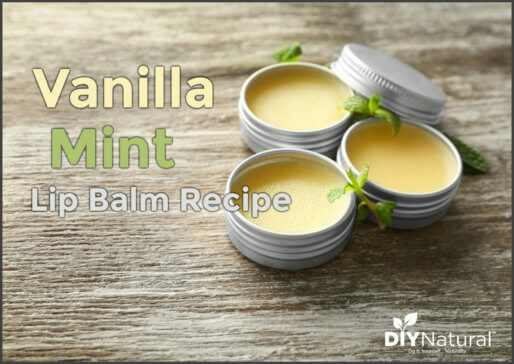 Here is a lotion bar recipe that smells like summer. Making lotion bars really only involves two to three ingredients: beeswax, oils, and essential oils. I like to keep my bars nice and hard, so I always keep the ratio of beeswax to oils at around a 3:1 ratio (3 parts oil to 1 part beeswax). When I’m using softer oils like coconut oil or liquid oils like sweet almond I increase my beeswax to a 3:2 ratio (3 parts oil to 2 parts beeswax). Since it’s the tail end of winter and my skin is still in need of some extra intensive moisturizing, I decided to go with cocoa butter and coconut oil as the “oil” part of my Easter Egg Lotion Bar. The cocoa butter makes the lotion bar so thick and smooth and really works well as a moisturizer. Plus, I chose to use unrefined cocoa butter so my lotion bars would have a delicious chocolate smell. You can choose to use refined or unscented cocoa butter if you want to scent your lotion bars with a different essential oil. I also chose to use coconut oil because it melts so wonderfully and works well in any lotion bar. Coconut oil melts at 76°F, so it will melt when it comes into contact with skin. It’s also a very effective moisturizer for all skin types. I chose to put my Easter Egg Lotion bars in some cute plastic eggs, but this recipe will work with most candy molds or soap molds. 1. In a double boiler (or a glass measuring cup inside a small pot of water), melt beeswax. 2. Measure in cocoa butter and coconut oil. 3. Allow everything to melt completely, stirring occasionally (this could take a little while). While you are waiting for everything to melt, prepare your molds. 4. 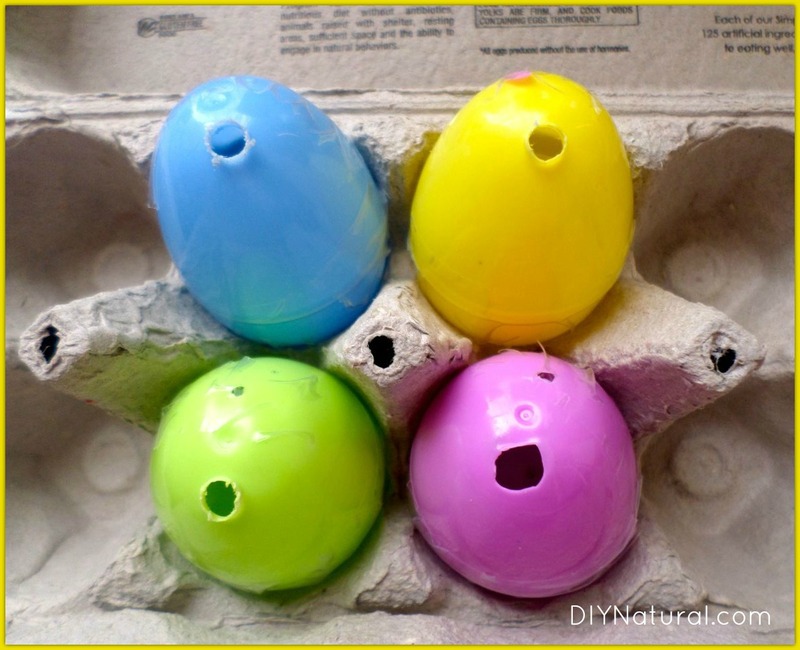 Gather plastic Easter eggs and cover the holes on the bottom of the egg with clear tape. Tape around the middle of the egg, creating a tight seal. 6. Place the eggs in an egg carton to help keep it upright. 7. Once the lotion has melted completely, give it one final stir and allow it to cool slightly. 8. When the lotion is still liquid, but slightly cooled, pour into the prepared egg molds (or other soap or candy mold), filling completely. 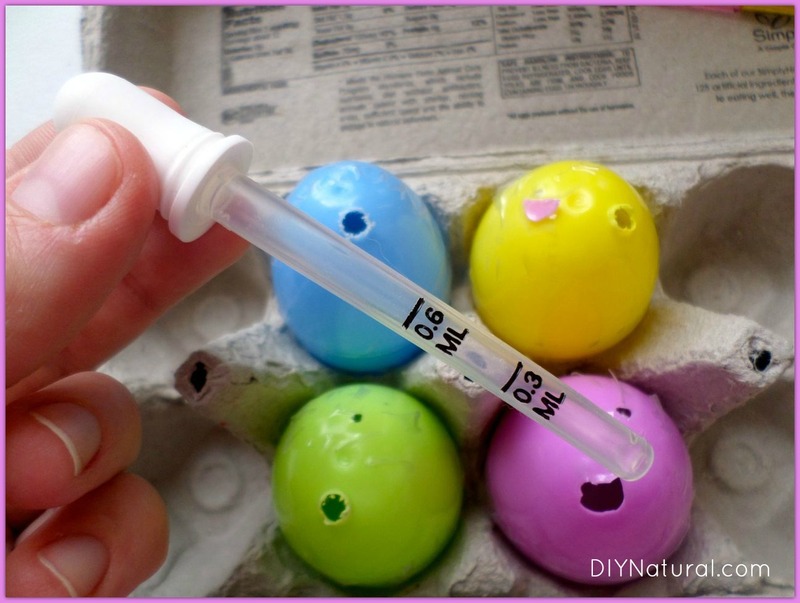 I like to use a medicine dropper for this so I can get the lotion into the small holes in the eggs. 9. Allow the lotion bar to cool and harden completely while in the molds. To easily remove the lotion bar from the mold, place the mold in the freezer for a few hours. The lotion bars should pop right out once frozen. I chose to leave my lotion bars in the Easter egg mold because they look super cute in Easter baskets and the mold helps protect the lotion bar from getting dirty. That said, these homemade lotion bars are great for any time of year! Looking for more DIY Easter projects? 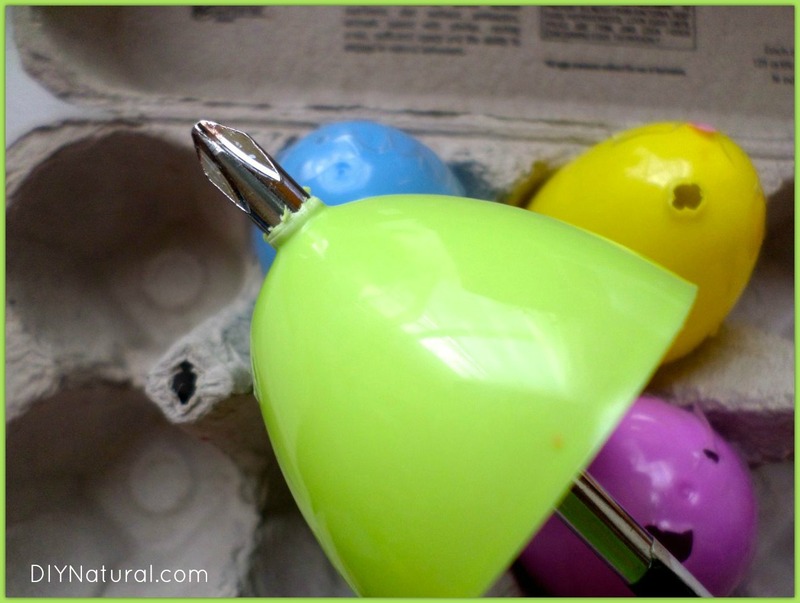 Check out this post on Dying Easter Eggs Naturally. Lotion bar idea was great, inspired me to make my own lotion bar with sheep tallow. Great natural lotion. Thank you. I would like to try to make these, but have no cocoa butter. What I do have is a big chunk of raw shea butter. Would that work as a substitute? I bet with the cocoa, coconut & beeswax these smelled AMAZING! Is there a good substitute for coconut oil? My daughter is allergic to coconut. OMG! This is a GREAT idea! I will have to try this for my daughters. You are very creative! Thanks for a terrific idea! hi. thanks fot fun idea on the egg lotion bars, i will make them. im surprised how easy they sound to make. Do you have a picture of them out of the egg? Trish, we just added an image to the top of the article with a picture of the bar out of the egg. Hope that helps! Love this idea! How many eggs did this amount of ingredients make? Hi Melanie! This made about three and 1/2 eggs, but it would have made four if I wouldn’t have spilled as much.